The Bushnell Elite Tactical DMR 3.5-21x50 is a great scope option for the money. It offers a variable 3.5-21x magnification range allowing for shot placements from short to long range. Some of its features include a Revlimiter Zero Stop, side parallax adjustment, fully multi-coated optics, RainGuard HD and target turrets. 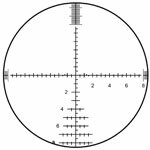 This scope also comes with Bushnell’s lifetime, no questions asked Bulletproof Guarantee. All of these features come together to create a scope that will grant you the ability to hit your targets with accuracy and efficiently while providing a great dollar to value ratio.